Sobriety checkpoints, or DUI roadblocks, are temporary installations used by law enforcement to catch drivers who are under the influence of alcohol. 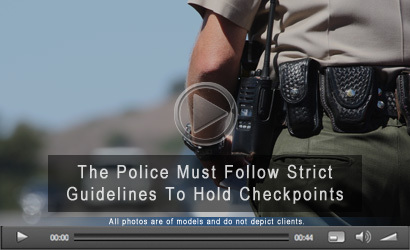 This approach was modeled on the success of roadside safety checks and license and registration inspections. At a sobriety checkpoint, officers either stop every vehicle or use a specific pattern to stop certain cars on a public road to investigate if drivers are impaired. These checkpoints are often set up late at night or early in the morning, when the highest percentage of drunk drivers is on the road. The officer may ask to search your car. This means they do not have legal grounds to search your car, and you may refuse this request. If you are ordered out of your vehicle, lock the door behind you. If you are asked to perform a field sobriety test, you may refuse. These are the tests where you are required to walk in a straight line, touch your nose or recite the alphabet. If you refuse to take these tests, the officer will have one less reason for arresting you should it result in a DUI charge. The officer may ask you to take a breath alcohol test to determine your blood alcohol content level. You can refuse this test, but the consequences for refusing are almost as severe as a DUI charge. Do DUI Roadblocks Make Roads Safer? There is some argument about whether or not roadblocks actually work to reduce the number of drunk drivers. The National Highway Traffic Safety Administration (NHTSA) has concluded, after numerous field studies, that the number of DUI arrests made by roving patrols is nearly three times the average number of DUI arrests made by officers at a sobriety checkpoint. However, police officers believe that roadblocks are effective, even if drunk drivers get around them, because they show the public that driving under the influence is not tolerated. Copyright © DUICheckpoints.Org, All Rights Reserved.